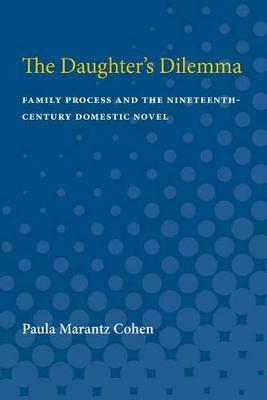 The Daughter's Dilemma breaks new ground in literary studies through its application of family systems theory to the analysis of nineteenth-century domestic novels. Cohen argues for structural correspondences between families and novels: as systems seeking closure, they are governed by certain analogous laws. She argues further that the father-daughter dyad is the pivotal structure by which the nuclear family and the domestic novel were able to define themselves as closed systems. The study treats novels by Samuel Richardson, Jane Austen, Emily Bronte, George Eliot, and Henry James and places them in the context of the writers' individual family experiences. Drawing on recent work in literary and feminist criticism, anthropology, history, and psychoanalysis, as well as family systems theory, Cohen seeks to critique the limitations of these theoretical models even as she employs them to illuminate the texts under discussion. The study's approach leads to insights about the contemporary family and about the present state of literature and literary criticism. Cohen concludes by suggesting that the modern period marked the demise of an ideology favoring closed systems. The result has been both a nostalgia for those systems and a redefinition of experience and relationship as open and subject to endless interpretation. Such an ideological reformulation helps explain the present insistence by literary theorists on the inescapability of the text and the "reality" of representation.